Container Market Report September 2018 | EF International Ltd. The earthquake of seismic intensity 7 (Magnitude 6.7) occurred in Southwest Hokkaido at past 3 am on Sep. 6th. Sapporo and Tomakomai was a little over 5 in Seismic intensity. It was seismic intensity of a little over 5 in Yokohama when the Sanriku Offing Earthquake of seismic intensity 7 (Magnitude 9.0) happened on March 11, 2011. I could imagine how big it was in Sapporo and Tomakomai of seismic intensity a little over 5 as I experienced it before. I was worried about our business partner of Sapporo, Tomakomai and Kushiro. I wished that they were safe. A blackout happened in whole Hokkaido and, fortunately, a blackout of 50% dissolved the next day and reopened Chitose International Airport. On the other hand, it was several landslides that were reported in TV, a newspaper many times. It must be true that a large quantity of rainfall which typhoon 21 brought Hokkaido by the day before enlarged damage by a landslide in each place in Hokkaido. Typhoon 21 also brought heavy damage in Kansai. Kansai Airport made in the artificial island of Gulf of Osaka Senshu offing 5km and opened in September, 1994 has been flooded on a large scale. Besides, a tanker collided with the bridge which linked the airport and it could not be used, and 3,000 people were left behind in an airport at one time. Kansai Airport is used by more than 78,000 people per day in average. A part of operation as the international airport was reopened four days later but the confusion is still continuing. In addition, the typhoon lets Rokko container terminal of Kobe buried in water to an altitude of 1m at the time of high tide, some gantry cranes collapsed, A mount of containers piled up to 2 or 3 high destroyed and some containers were flowed out into the sea. It has turned out that the typhoon has recognized us how fragile the infrastructure of the major Japanese ports were as the entrance of marine nation. What took my eye conspicuously is that 51 of Ferrari cars put in Rokko Island soaked in seawater and became total loss. The total damage seems to amount to several billions of yen. I would like to make a proposal here. How about a Ferrari car is put in One Side Open container or Both Side Open container to keep? A Ferrari car on container must have been free from soaking in the seawater if it is stacked on 2 container high or more. It is simply moved by a forklift if Ferrari is put in the container. It would be risky every time a man gets on and moves it on the ground. It is quite cheap if the cost of about 800,000 yen per 20f Side Open Container (ex Japan port) would protect a Ferrari car of tens of millions yen from an earthquake, flood disaster. There are expected to be more containers and complicated movement of containers with various countries linking to China and USA as it is to say that cargo flow of import and export will change. Therefore, I think it would give sales staff of shipping lines interesting development to solicit cargo. It is necessary to pay attention sequentially. According to the announcement of U.S. Department of Labor on Sep.7th, the employment statistics of August says that the number of the employee of the non-agriculture section increased 201,000. The average wages per hour recorded by a 2.9% raise compared with the previous year which was high growth since June, 2009. On the other hand, the container movement from Asian main 10 countries to USA in August is 1,456,040 TEU, 0.6% up from the same month a year ago, which exceeded for 18 months on end. The total from Jan to Aug was 10,794,978 TEU, 6.1% rise which reached a record high. 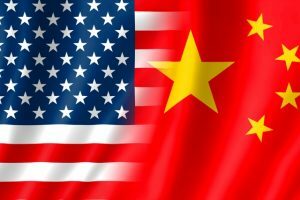 The influence of the U.S. and China trade war has not yet come out or is it reality that the people are toughly active according to Chinese proverb that there are measures to people if the country has a policy? New container price is $2,200 per 20f. Total amount of new containers in the factories in China is 870,000 TEU including reefer containers of 40,000 TEU as of the end of August. I was invited the party of Ocean Network Express (ONE) held at 6 pm on Sep 3 (Mon). ONE concluded a long-term lease (last October) before opening of business.UES which we acted as an agency won the first long term lease of 10,000x40f HC from ONE. I was so moved to see the video which ONEU000001 of the Magenta-colored 40fHC container was showed the scene of loading off from Magenta-colored ONE’s ship. 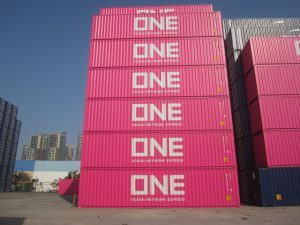 I was told by many people that “That is UES’ container. Isn’t it?” , “40f HC is L/T supplied by UES!”. President Kido of ONE Japan clearly mentioned that all people can expect ONE staff for all from now on because we have already established ONE consciousness all ONE staff could share other than the sense of three motley crews. After all, the organization consists of a person. Therefore, they could do nothing if they become one in heart. Much young ONE staff diligently carried a drink to the visitor in the same way as a companion. When I got a drink from one of them he said that “ I read your container market report every month”. I was so impressed to hear it from such a young staff of ONE and he seemed to be very dependable.